Madhuvanti is a raga used in Indian classical music. 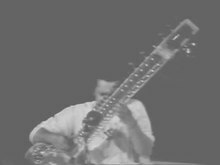 It is a Hindustani music raga, which is reported to have been borrowed into Carnatic music, and is structurally similar to Multani. This Raag is based on Todi Thaat (Mode). It is a romantic raga based on the foundation, eternity and colors of love. Madhu literally means honey. It is a very sweet raga with a very simple philosophy of love and romance. Madhuvanti's notes are N S Mg M P N S'(Mg in meend) while ascending and all the swaras, S' N D P M g R S, in the descent. 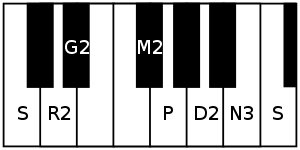 (notations M - tivra,g-komal gandhar). Madhuvanti belongs to thaat Todi. Madhuvanti is played after 4 pm before 8 pm. Madhuvanti expresses a gentle loving sentiment. It depicts the sringaar rasa, used to express the love of an individual towards his or her beloved. Madhuvanti is the janya raga of the 59th Melakarta of Carnatic Music, Dharmavati. The notes used are Chathusruthi Rishabham (R2), Sadharana Gandharam (G2), Prati Madhyamam (M2), Chathusruthi Dhaivatham (D2) and Kakali Nishadham (N3). Notations of Carnatic music and Hindustani music differ a little bit (see swaras in Carnatic music for details on above notation and terms). It is an audava-sampurna raga (5 notes in ascending and all 7 notes in descending scale). Madhuvanti is a popular raga. This raga has been used to compose many tukadas (short compositions sung towards end of Carnatic music concert). It has also been used in Indian movie songs and music as it lends itself to lilting melodies. This page was last edited on 5 October 2018, at 21:17 (UTC).